A soothing sense of calm envelopes the mind, body and spirit with this lavender aromatherapy mist. Effective, yet gentle a mist deodorant for sensitive skin. Stay odour free the natural way. 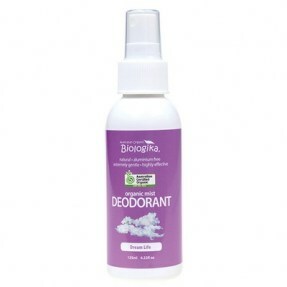 Ingredients: Organic Aloe Vera, Purified Water, Organic Sugar Cane Ethanol, Xantham Gum, Lavender Essential Oil, Ylang Ylang Essential Oil, Potassium Sorbate, Citric Acid, Origanum Vulgare Leaf Extract (and) Thymus Vulgaris (Thyme) Extract (and) Cinnamomum Zeylanicum Bark Extract (and) Rosmarinus Officinalis (Rosemary) Leaf Extract (and) Lavandula Augustifolia (Lavender) Flower Extract (and) Citrus Medica Limonum (Lemon) Peel Extract (and) Mentha Piperita (Peppermint) Leaf Extract (and) Hydrastis Canadensis (Golden Seal) Root Extract (and) Olea Europaea (Olive) Leaf Extract.